SOFIA AVRAMIDOU Sacred songs and music of modern times · Song: Sofia Avramidou · Clarinet - Accordion : Kosmas Papadopoulos · Guitar: Andreas Ziakas · Piano: Sakis Kontonikolas The singer Sophia Avramidou and the three musicians will present a program which includes spirituals and contemporary songs by Greek and foreign composers, having a religious content. BYZANTINE CHOIR "SAINT ANDREW OF CRETA"
TWO GREAT GREEKS : EL GRECO – MANOS HADJIDAKIS ( 400 and 20 years, respectively, after their death) - With video projection Two great Greeks : Domenikos Theotokopoulos (El Greco) and Manos Hadjidakis The Patmos Festival Orchestra conducted by Alkis Baltas Soloist : Vassilis Gisdakis (song ) The concert is dedicated to the 400th anniversary of the death of El Greco and the 20th anniversary of the death of the famous Greek composer and song writer Manos Hadjidakis. The concert has two parts: • The first part includes video projection of religious works by the great Greek painter, while the orchestra performs classical pieces. Brief texts concerning the life of El Greco will be recited in Greek and English. • The second part includes video projection of Manos Hadjidakis' photographs, along with texts about his life and work. 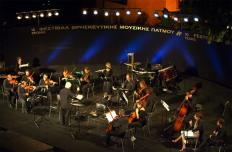 Vassilis Gisdakis, a close associate of the composer, will perform excerpts from the song cycle "At the Roman Agora" orchestrated by Vicky Stylianou . The Festival is co-organized by the the Municipality of Patmos, τηε South Aegean Province and the Secretariat General for the Aegean and Island Policy. It is supported by the Monastery of St.John the Theologian.